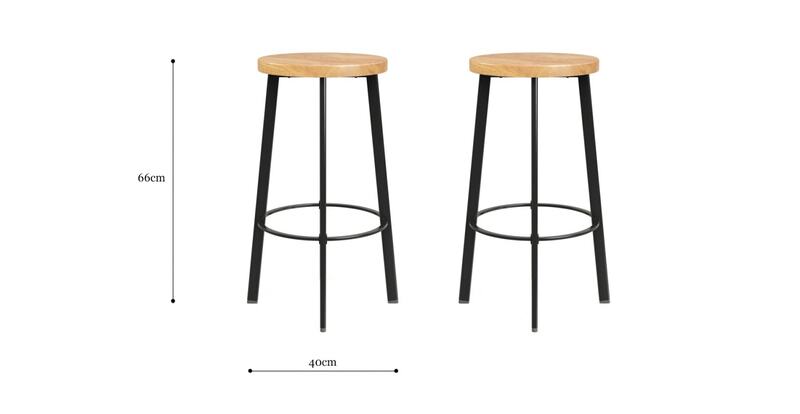 The Wentworth Set of 2 Bar Stools combines function with form for a versatile addition to the home. The mix of materials including a black steel frame and polished wooden seat adds an industrial edge to the look. Style it with the Bowen Bar Table (pictured here). The Wentworth comes as a set of two, making it easy for you to build your set however big or small you please. The quality construction of the stools ensures they are made to last. The seat of the Wentworth is comfortable and high quality, crafted from polished Solid Ash in a light natural shade to match any interior, and perfectly complementing the darker frame. The Wentworth frame has slim clean lines, and is built for strength. The simple silhouette gives the piece a modern look, with black powder coating adding an industrial edge.